The Daily Toad: Proudly disseminating sensationalised rubbish since 1645. 7th March 2008. "I haven't spent the best part of my life trading up the property ladder for me to stop right here," said A. Robin yesterday, "we were hoping to trade up to a two-bedroomed nest somewhere in the oak. I've had my old nest on the market for over six months and no-one's even been round to look at it, let alone make a sensible offer." 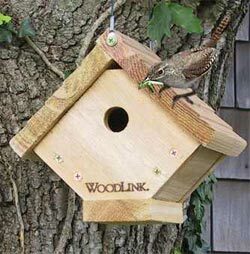 But lower nest prices may not be the only consequence of cheap and readily obtainable bird-boxes. "Although this is definitely good news for the first time builder," explained an avian sociologist yesterday, "there are still downsides. The overabundance of nesting sites has led to a relaxing of traditional territorial displays, which has led to a decline in the strict moral code by which birds conduct themselves. Young males with time on their hands have been causing mayhem at the bird bath. And the hens! They're worst of all." But it's not all bad news. 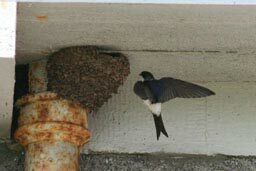 For the millions of birds who find bird boxes unsuitable, nest prices have continued to rise, with an end-of-eves housemartin's pad fetching at least 20,000 aphids. "The mud-built nest market is booming at present," said an industry spokesman, "but as always it's the location that counts for everything. High up and South-facing go for the most, but even a derelict nest in the countryside for use as a second nest can still fetch a good price - as long as it has planning consent and there are no cats about." Speeding Swift was 'showing off', court hears.